For the most serious collector with a passion for golf or the average duffer who wants to learn more about golf, there are many sources to satify everyone's needs. World Golf offers a selection of museums, private collections and clubs that offer a varied selection of golf memorabilia. While most are available to the public on a regular basis, some, such as the private collectors allow visits only by appointment and it is not always easy. Many clubs that were previously owned by PGA pros are on display in this collection. Call first to arrange a visit. The collection began with the opening of the club in 1887 by Joseph Mickle Fox after being taught the fundamentals of the game by Old Tom Morris of St. Andrews. The collection includes clubs, balls, books and artwork. The club is open 7 days a week during the months of April to October. Call first for access. Members of the club who were also great players of the past are honored in this private exhibit. Jones is featured with over 268 books from his personal collection. The trophy case includes replicas of trophies won by Jones as well as other club members including Watts Gunn, Charlie Yates and Alexa Stirling Fraser. The collection is open Tuesday through Sunday. Call ahead for times and access. Collection of British Columbian and Canadian golf historical items. Open Tuesday through Sunday. The history of the game is told in this collection of clubs, balls and artwork. Opened in the summer of 1990, it is located behind the Royal And Ancient clubhouse. A private collection of clubs and artwork, guests of the Broadmoor resort are given full access. Equipment, golf art and a small library are available here. You can see the evolution of the golf balls and clubs. Of particular interest is the earliest color golf illustration created in North America in Montreal in 1885, an iron club used by J.H. Oke, the first Canadian Open winner and a leather-faced driver of Willie Park, winner of the first British Open in 1860. Open daily with no admission charge. Ben Hogan memorabilia including medals and trophies are on display. Call for opening days and hours. The highlight of this private collection is the featherie balls, early golf books and early golf oil paintings and watercolors. Excellent examples of early equipment and ceramics round out the collection of Archie Baird, the owner and curator. An appointment is required to visit. Many intriguing items make up the collection at this museum which claims to be the oldest golf museum in the world. Some of the items include some long-nosed woods of Tom Morris, the putter used by Horace Rawlins when he won the first US Open Championship in 1895, the clubs that Harry Vardon used to win the 1900 US Open and a wooden putter made around 1790 by Simon Cossar of Leith, Scotland, a well known clubmaker of his day. Visitors are welcome daily but an advance phone call is requested. Relatively new museum (1987) with primarily British golf material. A relative new museum opened in 1990. Included in the collection are a rare wicker golf bag made in Hong Kong and one of six 1926 reproductions of "Calamity Jane" - Bobby Jones' putter. You can also see a 19th century "Kolven" club. The Dutch invented Koven which some believe to be the beginning of golf. A small but varied collection of memorabilia including balls, clubs, tees etc. Private club. Contact first for access. Access to this collection of books, artwork and clubs is limited to members and guests. Housed in the offices of the association, collection of books, cubs and balls may be studied during office hours. Please phone first. Of the two sites at this location, Old Marsh is the best known but harder to gain access to unless you are escorted by a member. Old Marsh has a putter owned by Willie Park and a club made by James McEwan in 1770 that has a lead weight which has been hollowed out to suit the player who used it. The other site, Harbour Town, also has a good collection and access is easier. Call for more information. A tribute to golfer Francis Ouimet but also includes equipment of other famed Massachusetts and New England golfers. Call ahead for access. A Walter Hagen wedge and a putter owned by Tom Morris along with a collection of rut irons are included in this very exclusive club. A small library is also on the site which is limited to members and their guests. Highlight is the 90 foot long display featuring original artwork, feather balls and vintage clubs in a complete history of golf. Check out the golf ball wall covered with more than 13,000 logoed balls. Operated by the PGA of America, you can visit the museum daily from March 1 to December 1. A great library with books on Scottish history, golf history, golfers biographies and every other type of book relating to golf. It is funded by the City of Industry as a public library. Among the great finds is a copy of The Life Of Tom Morris with autographs by Tom Morris and the author, W.W. Tulloch. Golf in Canada is commemorated with books, clubs and trophies. You can also visit the Canadian Golf Hall of Fame. Open weekends only. Royal North Devon Golf Club Museum at Westward Ho! A new collection opened in 1985. Housed at one of Britain's oldest clubs. Visitors welcome. Call ahead for hours. Collection contains mostly clubs and books. Open during Association Hours. Call ahead to confirm. 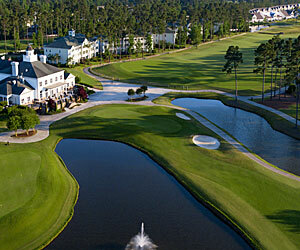 Build your own Myrtle Beach Golf Package. Mix and match golf rounds from all area golf courses at the best available price. Pricing starts at $99 per golfer per day includes golf and lodging.